The far origins of this interfaith shrine, however, lie in Vatican II. From the very beginning of the Council, John XXIII’s invitation to observers from other religions set the tonus for future ecumenical dialogues. (5) Such dialogue, supported by the Conciliar documents, has spawned even temporal organs to promote dialogue among religions. One such organization is the World Conference on Religion and Peace (WCRP), a part of the United Nations. Above, at the 1994 WCRP assembly, Nikkyo Niwano welcomed the participation of John Paull II. 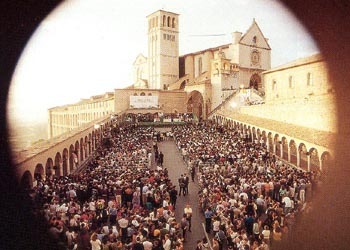 The WCRP helped to organize the first Assisi meeting in 1986. It enjoys the strong and uncritical support of John Paul II. 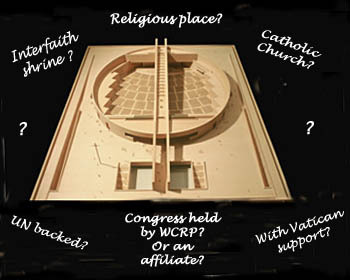 As mentioned in the Portugal News report, it was the Pope who co-sponsored with the WCRP the 1994 meeting of 700 pagan and so-called ‘Christian’ representatives at the Vatican and himself opened the first session. 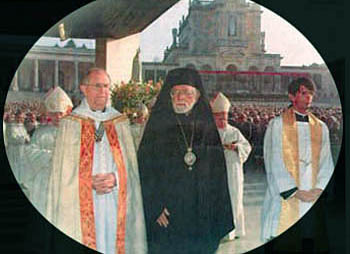 This Vatican event was considered a milestone in ecumenical relations. In my last article, I analyzed a press conference convoked by Archbishop Michael Fitzgerald, the Vatican representative, along with Msgr. Luciano Guerra, whose purpose was to “deny rumors” regarding the future shrine. I also checked another interview Fitzgerald granted to the English weekly The Universe with the same intent. Notwithstanding such “denials,” they affirmed in different words precisely the same thing that the Portugal News stated. That is, an interfaith shrine will be built in Fatima, and it will host all the religions to worship their respective gods. Therefore, the “denial” was just a maneuver, an attempt to fool the naïve. Since Msgr. Guerra is obviously no stranger to this tactic, I was naturally suspicious that his new communiqué denying that the WCRP had hosted the October conference could be another trick. I called the WCRP headquarters located in the UN building in New York, and spoke to director Kyoichi Sugino, a Buddhist monk. He was much less categorical in his reply than Msgr. Guerra. He said that the WCRP was an international organization with many affiliates. One of these, the European Conference on Religion and Peace, which itself has about 10 national affiliates, “might have co-sponsored such an event.” At the end of an explanation of the complicated WCRP network, he still was not sure on the participation of the European branch of the WCRP. “Yes,” he politely told me. “But it might take some time,” he added. I sent him an e-mail reminding him of my request, and I am looking forward to receiving some clarification. When Msgr. Guerra said that the WCRP did not sponsor the event, did he still mean that it might have participated in some way in it? If so, would he just be making a theoretical distinction to deviate attention from UN participation in the event? When Msgr. Guerra affirmed that the WCRP did not sponsor the event, was he including in this denial the participation of European Conference on Religion and Peace (ECRP), which is actually an affiliate of the WCRP? If so, would he just be dancing around the issue with different names to hypocritically discredit the Portugal News? I hope Mr. Sugino will give me the elements to answer these questions. I will update readers when he responds more definitively on the WCRP’s connection with the Fatima pan-religious conference. That is to say, the sects present at the congress, including Anglicanism, the Eastern Orthodox, Hinduism, Buddhism, and Islam, were invited by the Catholic authority of Fatima. It assumed the entire responsibility for the event. The interfaith congress was held in the Paul VI Pastoral Centre and presided over by the Cardinal Patriarch of Lisbon José de Cruz Policarpo. Among other Catholic dignitaries, a Vatican representative, Archbishop Michael Fitzgerald, president of the Pontifical Council for Inter-religious Dialogue, monitored the conference and spoke on the final day. It is impossible to imagine the event took place without the knowledge and approval of the Vatican and John Paul II, who has endorsed and hosted so many similar events in the name of dialogue and the spirit of the Council. It is an event quite similar to the Assisi Encounters, where the Pope himself issued the invitations for protestants, schismatics and pagans to intermingle and dialogue with Catholics as equals in the name of world peace. 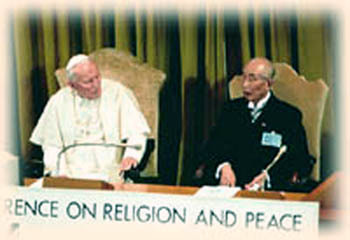 Above, the inter-religious meeting at Assisi in 1994 - Inside the Vatican, October 1994. Below, the same genre of encounter at Fatima, 2003 - Noticias de Fatima, October 24, 2003. What we had at this congress is simply the same genre of interfaith activity transplanted from Assisi to Fatima. It would have been worse, in my opinion, had the Fatima congress been sponsored by an umbrella group of the United Nations. But it was bad enough that it was organized under the authority of the Catholic Church. And in the name of the spirit of Vatican II. It is a quite valid point. Our Lady did not come to Fatima to promote the pan-religion John Paul II has encouraged throughout his pontificate. She asked for conversion, affirmed the existence of Hell for the impenitent souls, insisted many times that Catholics pray the Rosary daily, and warned of a chastisement upon the entire world should her message be ignored or unheeded. What is happening is worse. Her message is being profoundly distorted - to fit with the ecumenical spirit of Vatican II and assist in the formation of a pan-religion with its promise of a false peace. 1. “Fatima to Become Interfaith Shrine,” November 11, 2003. 2. “Traditional Catholics Attack Fatima Interfaith Congress,” Portugal News, September 20, 2003. 5. Atila Sinke Guimarães, Animus Delendi II, Introduction (Los Angeles: TIA, 2002), p. 28. 6. “Fatima to Become Interfaith Shrine,” Ibid. 7. A. S. Guimarães, The Universal Republic Blessed by the Conciliar Popes, (TIA, 2002). 8. Cornelia Ferreira points out the remote origins of the WCRP in the 19th century in “The One World Religion,” The Remnant, November 11, 2003; “The Perestroika Deception Updated,” Catholic Family News, March 1996. 10. “Traditional Catholics Attack Fatima Interfaith Congress,” Ibid.